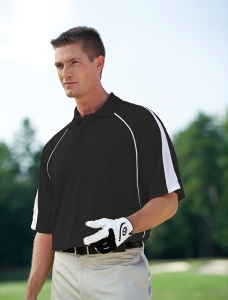 Mens 100% polyester Willowtec cool mesh golf shirt. Features High Performance Moisture Wicking and Anti-Microbial treatments. Full body contrasting front piping and contrasting wedge sleeve insert. Raglan and hemmed sleeves. Three dyed-to-match buttons. Side vents with extended tail. Half moon sweat patch. Tagless heat seal label.